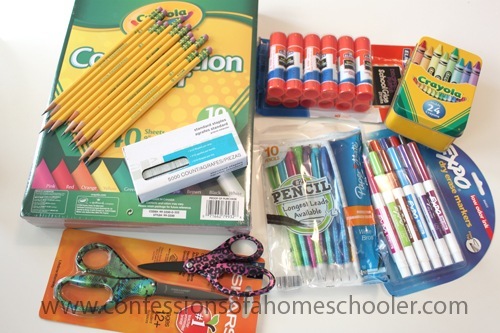 I have to admit that this time of year is my absolute LEAST favorite time to homeschool. Coming back from Christmas break is hard for both me and the kids. I definitely lack motivation to do school. I mean who wants to do boring old school when you just came off of a crafting, baking, decorating, caroling, Christmas high? Not me that’s for sure! And not my kids either. As a matter of fact when I mentioned that we were starting school on Monday, all I heard was groaning. And some of it even came from the kids. So what do I do to get over those mid-year homeschooling blahs? That’s right. At the beginning of each school year, we’re always excited to start. With the prospect of brand new supplies, clean and organized desks, new curriculum, and just the excitement of a new year. So why not carry that excitement on into January? So here are a few tips on how we bring a little excitement into our new year. It might sound simple, but making time daily to be in God’s Word can make all of the difference in our family. Not just for me, but for the kiddos as well. As they’re getting older they have their own devotions they do, and when they’re younger they will either read with me, or use their picture Bible to look through while we all have quite time in God’s Word. I find when I’m starting to slack on time in the Word and prayer, my life gets crazy. 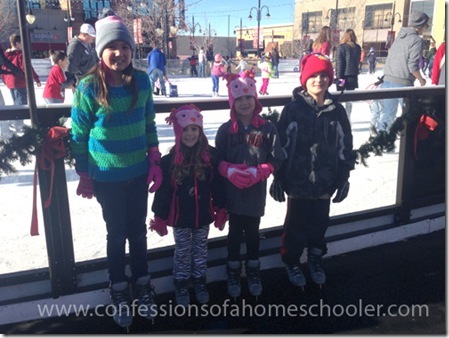 homeschooling seems overwhelming, the house goes awry, kids are maniacs, and so am I. God is the one who called us to homeschool, so taking time each day to reconnect with Him through His Word and prayer is the best way to get motivated about your calling! The first thing we do is take a day to clean up our school room. Everyone takes everything out of their desk drawers. 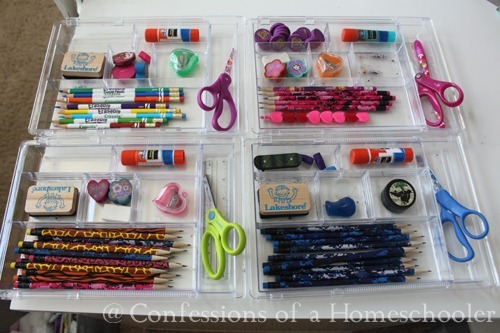 We re-organize their supplies, and straighten out all of their workboxes. We clean up the floors, toy bins, put up our new calendar, and get our room ready like we do for day 1. The next thing I do is get out my teacher’s manuals and run over what we’ll be doing the first week. Not only does it help me prepare, but it also gets me excited to dig back in as well. Just knowing I’m prepared is half the battle. I definitely don’t feel like starting when I don’t even know what we’re looking at for the week! This is also the time of year that we make any needed curriculum adjustments. 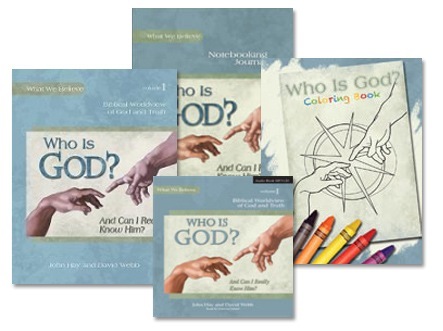 Right now we’re excited to start our new Who is God curriculum. We did a bit prior to break, but not enough to really dig into it. And with four kids together 24/7 in one house spending time in the Word is a must for us! I’m hoping the image at the top of this post inspired you. Simple as it sounds freshly sharpened pencils are well…they’re inspiring! I find that mid-year is when we start missing scissors, running out of glue sticks, and desperately needing to sharpen pencils or possibly even get new ones. We might also be running out of those little sticky notes and tabs, wall tape, Expo Dry-Erase markers, construction paper, and numerous other supplies we go through on a regular basis. 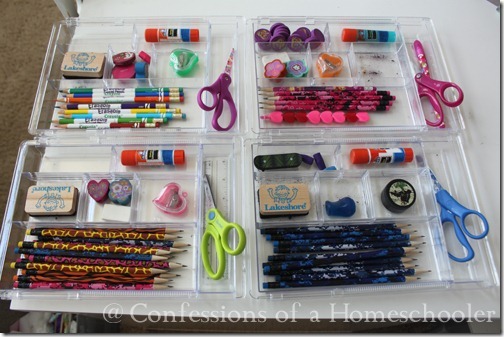 I also check our lessons to see if there are any needed craft supplies so I am prepared ahead of time and not tempted to “skip” the fun stuff. After we take an inventory of all of our supplies, we head to the store to pick up what we need. Restocking supplies always gets everyone excited, and they usually get to pick out something small like a new fun eraser, pencil, or notebook. It doesn’t have to be a lot, the little things seem to make the difference. Like freshly sharpened pencils just begging to be used! As part of our last hoorah for the season, we usually try to do something fun. It can be a field trip, bike ride, or some other outing. Not only does it get us out of the house, but it gives the kids one end-of-break-super-fun-day right before we dig back into the year. 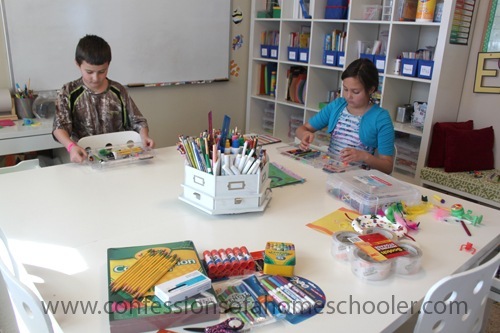 One of the things that keeps our homeschool going smoothly is my attitude. I find that our children feed off of my mood and it can set the whole day, week, or even year. So as I get the kids prepared and ready, I also need to do my own little motivation as well. This varies depending on the year, season, and me. But usually I will find a motivational book to dig into to get me excited and purpose driven about parenting and homeschooling our kids. Homeschooling 101 by Erica Arndt I know it might seem like I’m crazy reading my own book, but I don’t always stay focused and re-reading my book helps get me back on track for what I need to get done! Right before school starts up we do a whole family house cleaning day. Everyone gets a job and we attack the clutter. We clean floors, bathrooms, do laundry, clean out closets, take trips to good will, and do an over-all house clean to get it ready. I have to admit this last one is mostly for my own state of mind. I’ve always been like that, I used to clean my room before I could focus on my homework. As an adult I still find that getting our home in order really helps with my motivation to get school started! And it also lowers my stress level and that “I’m homeschooling four children, running a home, blogging, and everything else” overwhelming feeling. So starting off with a clean and organized home makes things go much smoother! This, friends, is where the rubber meets the road. 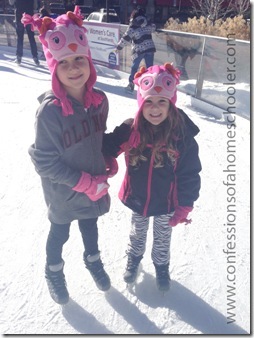 I’ve just given you some fun tangible ways to help re-motivate you and your kiddos. But the reality of it is that homeschooling is your job. You wouldn’t show up to work late, unprepared, and procrastinating the whole day. Well you might, but you’d be fired. 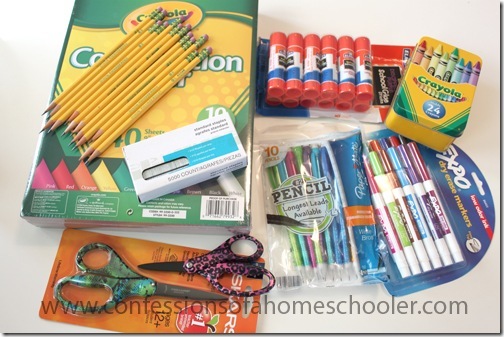 If you’re reading this and you are a homeschooling parent, then homeschooling is your job. Treat it as such. Plan your school year, get ready for your day, show up on time, and be ready to go. From 8am-3pm (or whatever your hours are) you are a teacher. You’re not a Facebooking-friend calling-email checking-tweeting-errand runner. I find that about 90% of my lack of motivation is that I’m not prepared. And the thought of the “unknown” just doesn’t sound that appealing. That or I’m just selfishly wanting to do something else more exciting. But I’ve committed to homeschooling our children. And so even when I don’t feel like it. I do it. I’m in charge of our children’s education and discipleship and that’s not something that can be pushed aside because I’m feeling lazy or unmotivated. Homeschooling is your ministry, your family is your ministry. Fulfill the calling God has given you. Be committed. Be diligent. Even when it’s hard. Even when you don’t feel like it. thanks for this Erica, just the reminder i need to read as i get ready to start our new term on monday. A new term with some big adjustments to make as we have a newborn now and my husband will be back to normal working hours again having been on hand with paternity leave and Christmas. Just the encouragement I need today! Thank you! Thanks, Erica! This is my first year homeschooling and I was ready to give up and send them back to public school. Thanks for the encouragement. We have a newborn and we are trying to get back on schedule but it has been and still is a struggle. May God bless you and give you strength Natalia! Enjoy your beautiful baby! A friend of mine is in the same boat right now. It is a hard season, lean on God, he will carry you through. Just the encouragement I needed today. Thanks for the encouragement. That is EXACTLY what I needed today. Have a blessed day! Thank you Erica! This is great life advice, whether homeschooling or not! Have a fantastic day! What a blessing this article was to me! With a long Christmas break and a house full of sick kids I was struggling to get started. This made it seem possible. Your blog is wonderful. Thank you!!! I needed this today! My kids are struggling to get back into it, and so am I. I have been struggling with low energy and even getting out of bed, and I know this is affecting us all. I am printing this off and it is going to help, I just know. Thank you for the words and plans that I needed to hear today! I was wondering if you have made any curriculum changes this year? Thanks for this post. It was very encouraging!